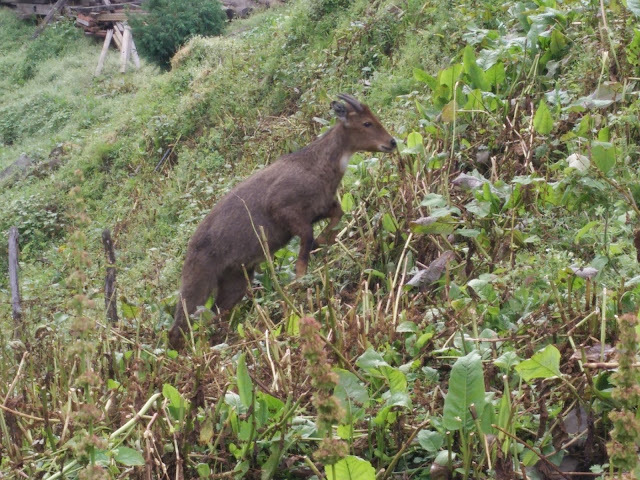 The Himalayan Goral (Naemorhedus goral) is a Near Threatened species that is believed to be in significant decline. It is found across the Himalayas including Bhutan, China (southern Tibet), northern India (including Sikkim), Nepal, and northern Pakistan between 900 and 4000 meter elevations. They usually inhabit steep mountainous areas, but primarily stays within rugged rocky terrain. They are usually diurnal, and are most active in the early morning and late evening, but can be active throughout on overcast days. On a recent trek up to Tango monastery, north of Thimphu in June 2017 we encountered a pair of Gorals which were surprisingly docile and unafraid. They allowed me to get close enough to film them with my mobile phone. Here is some footage of them. Since there is little threat to this species from the peace loving Bhutanese, I suppose they are not too afraid about the presence of humans and emerge around monasteries to feed on the local vegetation.